Sometimes I like to just draw with a mechanical 2B graphite pencil - and today I'm posting 2 of these drawings. 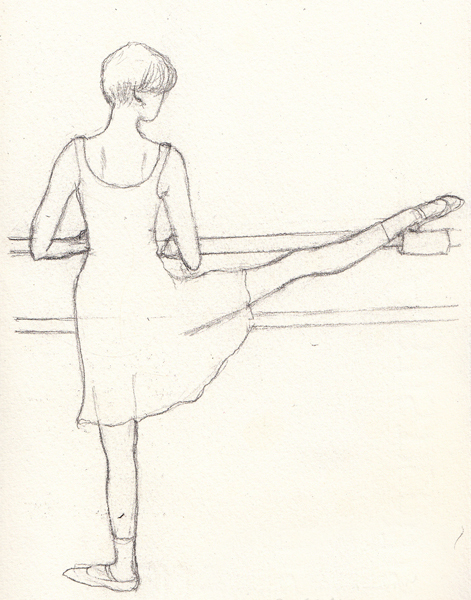 This is a drawing of my ballet teacher. I took a quick photo of her before class (with her permission) and then made the drawing in my sketchbook several days later at home. 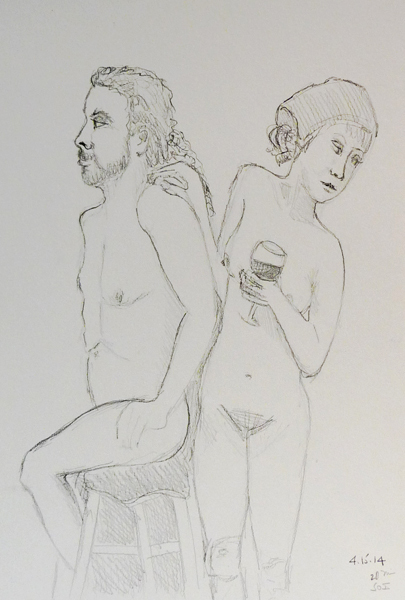 My husband and I went to the previews for the Impressionist and Modern Auctions that are being held in New York City this week and my favorite art was the drawings! 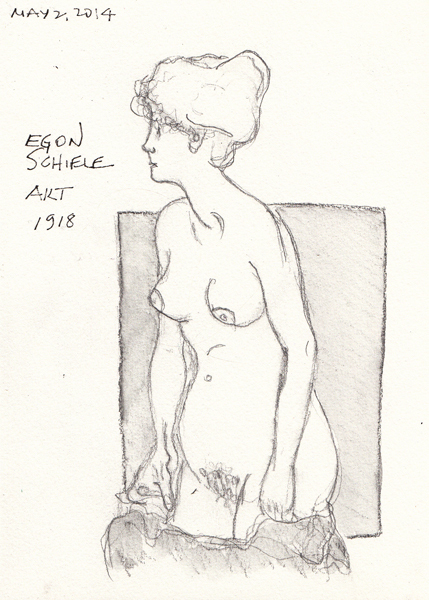 I always take my sketchbook and at Christies sketched an Egon Schiele figure called AKT (1918). The auction estimate price was $150,000 to 200,000! The auction is May 7th, so I will try to remember to check the auction page online to see the sale price. 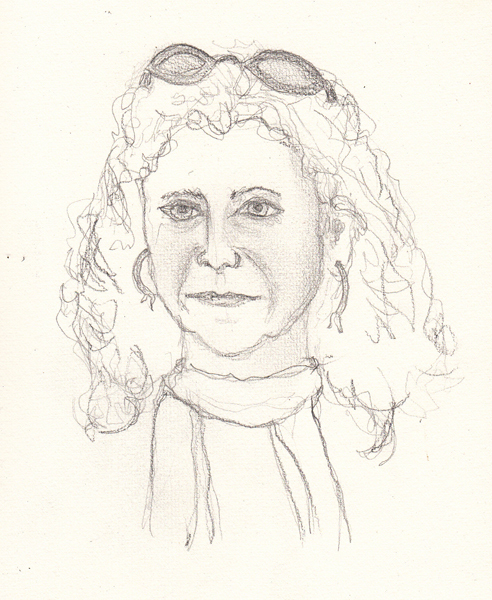 I decided to add an image of this drawing that I found online - the actual drawing does include all of her hair. 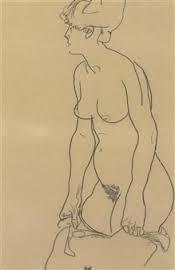 It is outrageous to think of these drawings, by many different artists, commanding such prices at auctions. But I do love making copies that I can enjoy. 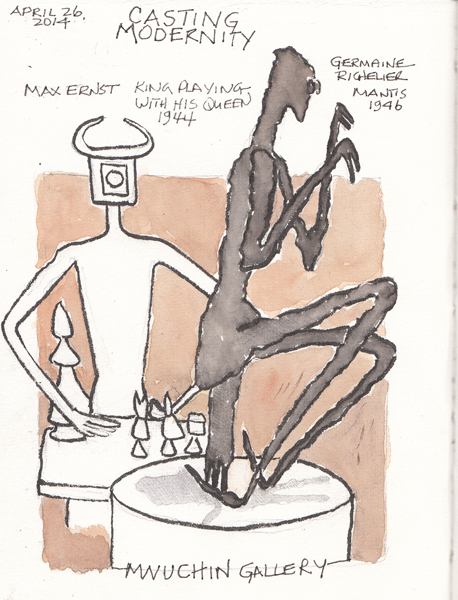 I am still periodically doing an exercise from this book, and here are three recent pages. I'm painting in a Strathmore 9 X 12 watercolor (140lb) Visual Journal - and using my usual Winsor-Newton watercolor palette. The paintings are too big for my scanner, so I'm photographing them and then trying to lighten the blue-tinged background page in Photoshop. 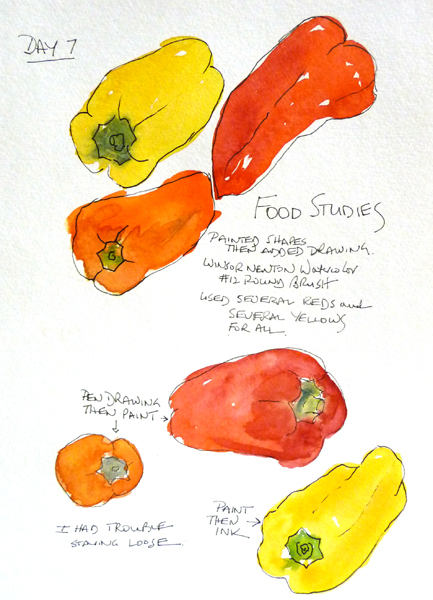 Exercise 7: I painted the shapes of peppers and then actually drew their shapes on the top half of the page. And then I sketched the red and orange peppers on the bottom half of the page - trying not to just color them in like a coloring book. The yellow pepper at the bottom was another one that I painted first and then added ink because it was fun! 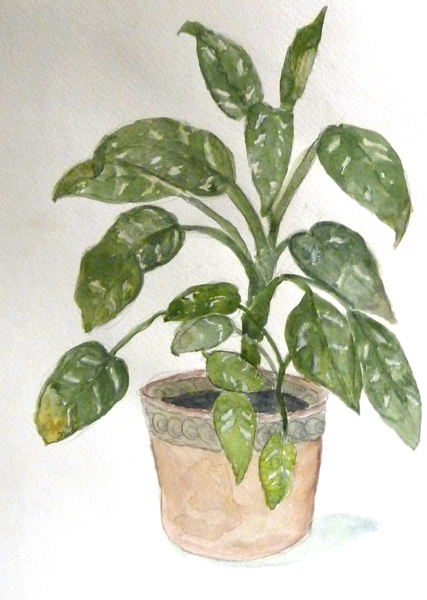 Exercise 8: Paint a plant paying attention to all of the different colors in the leaves. This is one of my house plants - the one with the most color variation. Exercise 9: Draw a bird - which was hard for me unless I wanted to freeze in Central Park as I waited for some of their regulars to appear. However, I took many photos of geese at the Stone Barn Center for Food and Agriculture last Fall. 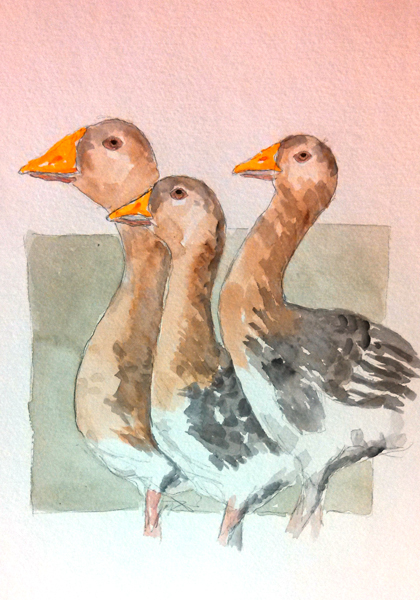 I was able to combine photos and paint 3 Toulouse geese for this exercise. My friend Teri knows that I am doing these exercises in an attempt to loosen up my painting - and when she saw this page - and their sample in the book - she just laughed! Apparently I'm not loose yet! When I go to my class at Fashion Institute of Technology (FIT), I can see some of the student exhibits this month. There is currently an extraordinary bird exhibit done by first year students. Pairs of students selected a type of bird, studied it in depth and then recreated the bird on a very large mannequin, using thousands of feathers. 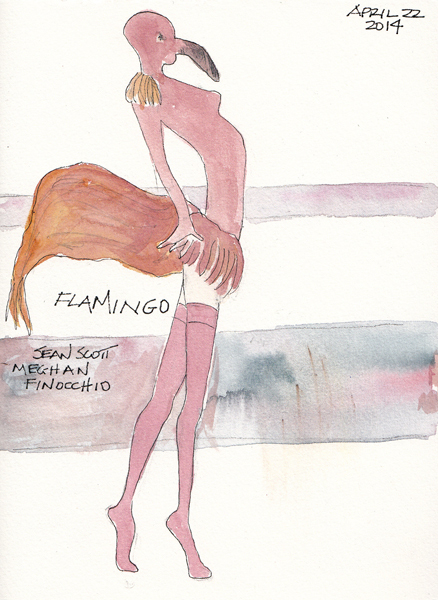 I LOVED the flamingo and took approximately 5 minutes to sketch it walking through the exhibit on my way to class. The week before I took a photo of it and I've posted that here too. There are about 20 enormous birds in the exhibit - such creativity!! Saturday morning I read about the opening of a New York City exhibit on ArtDaily.org. This is a wonderful daily news site about exhibits opening in museums and galleries around the world - with a daily short educational video as well. Mnuchin Gallery at 45 E. 78th St. currently has an amazing exhibit of approximately 30 20th Century bronzes by all of the big names of contemporary art ("Bronze in the 20th Century: Casting Modernity" April 24-June 7, 2014). None of these large pieces were obviously for sale - many came from museums and private collectors. My husband and I thoroughly enjoyed the installation in this magnificent townhouse gallery and I sketched two sculptures and painted them when I returned home. It is almost 5 years since I retired and one of my major concerns was finding friends who might share my interests - especially art. I always loved drawing and wanted to learn to use watercolors and keep sketchbooks - especially travel sketchbooks. And I'm delighted, as most readers of this blog know, that I found the best friends to share this newest passion. On Tuesday evening, Teri, Benedicte, and I decided to get together the following afternoon, around my dining room table, to play and "make something." Pat is currently in Barcelona with Gwen Diehn - an honorary member of our group - making art all day, everyday, for 2 weeks. 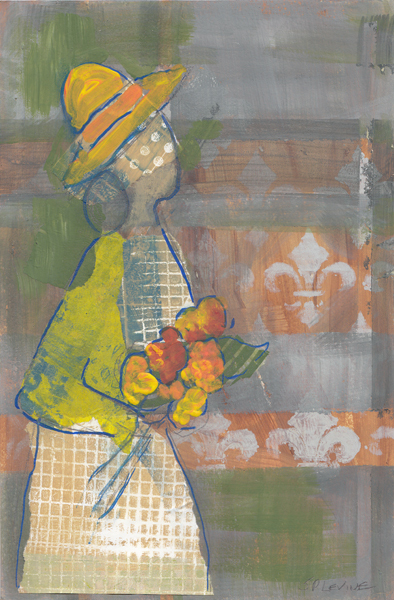 Teri proposed that she could bring some supplies and we could try to make abstract figures from an article in the current issue of Cloth Paper Scissors magazine. 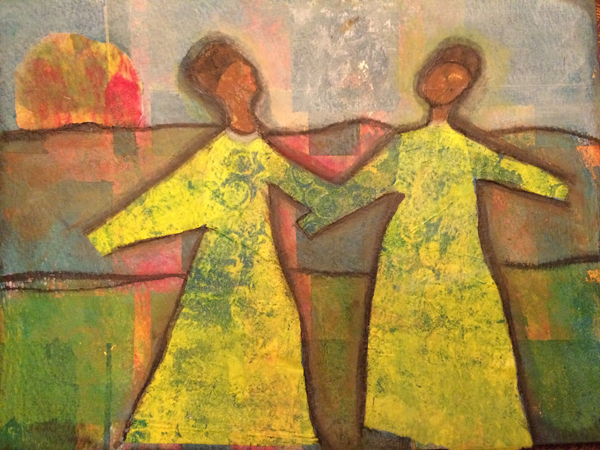 The article by Theresa Plas is called Abstract Figures - Building Layers with Tape Masks. I usually avoid any process involving acrylics, but thoroughly enjoyed these several hours during which we made collage papers with Gelli plates, painted several layers with different artist tape masks, added collage, and then pulled out a figure from the paper with Sharpie Paint Poster pens. All 3 of us enjoyed the process immensely - and just used whatever we had - making it a low stakes art experience. Here are our 3 paintings. The phone camera changed the colors, but it hardly mattered because we were "just playing" and enjoying an afternoon together. Mine: Definitely the least abstract - but expected with my interest in figure drawing! 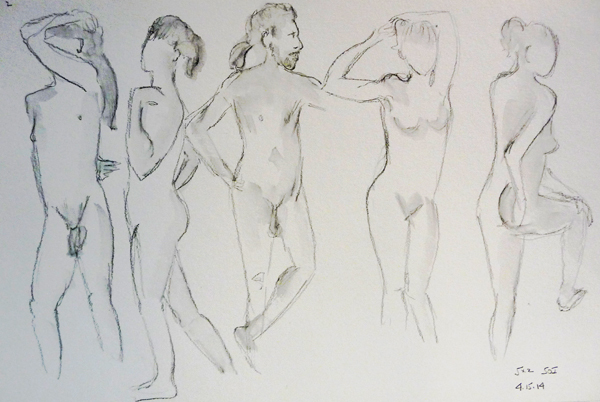 I love drop-in figure drawing at the Society of Illustrators, but missed it for months because of a conflict with my FIT class on Dye Painting Silk. Here are my drawings from last week - it was so good to be back, at least during my Spring Break from my class. All of the drawings were done on 12 X 18" paper and photographed instead of scanned. For anyone who might be interested in the importance of figure drawing for artists, I recommend the very readable book called The Undressed Art: Why We Draw by Peter Steinhart. I bought it in the Museum Shop at the Metropolitan Museum of Art - and found it to be informative and a wonderful review of the topic. 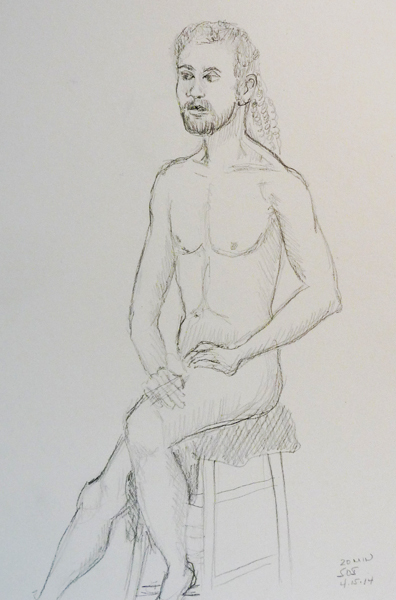 I recently enrolled for and watched a free Craftsy miniclass called Figure Drawing Atelier by Patricia Watwood and really enjoyed it.